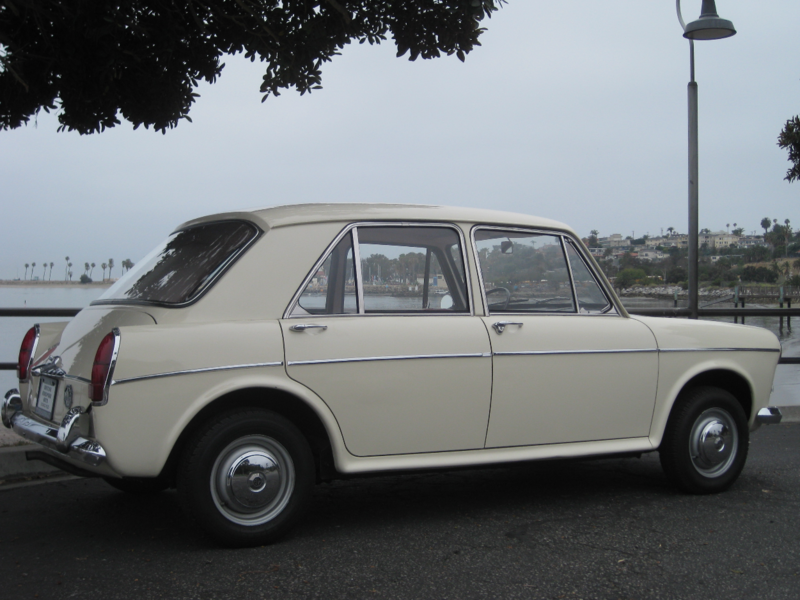 For sale is a very rare and equally adorable 1965 MG 1100 Mk I 4 Door Sedan. A two owner car that previously resided in Florida until it was brought into beautiful Southern California by its current owner two years ago. This car has a clear title with 9064 original documented miles and currently registered in California. For those of you who don’t know, the BMC family of 1100 sedans were the big brothers to the notorious Mini Cooper. 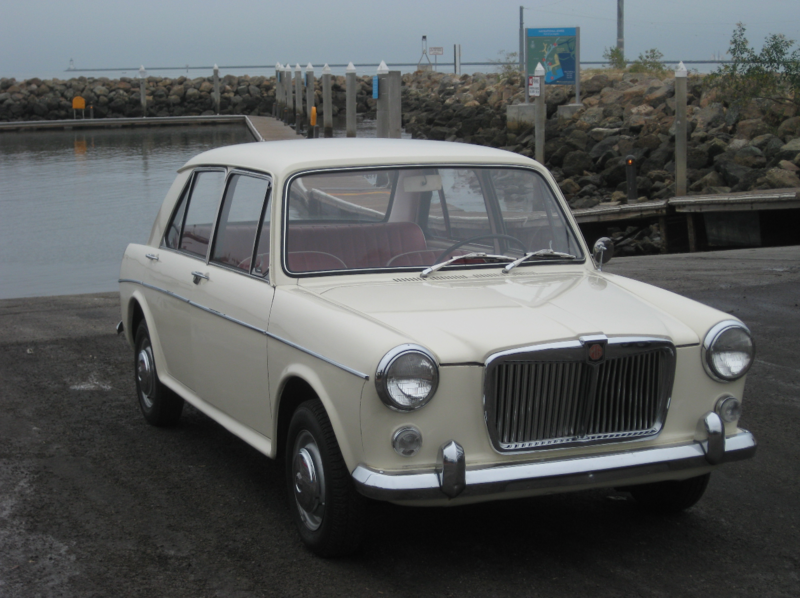 Although the 1100’s were quite popular in the UK, the reputation of the MG 1100 never seemed to reach the same status as the Mini did in the US, making it extremely unique and hard to come by on this side of the ocean. In fact you may have never even known that Mini had a big brother until now, but the good news is it’s not too late for you to get your hands on one. From cold this MG starts up easily with a pull of the choke, and settles into a nice idle upon coming up to temperature. The steering is a little off center and likes to pull to the right,it may need a wheel alignment. The brakes are firm, and the gear box is in good condition and it is easy to find all gears, however there is no synchro in first. It has a unique speedometer gauge that has the appearance of a retro radio including the total miles indicator working right below which reads just over 9K miles, which is incredibly low for a car of its era. The fuel gauge and water temperature gauge are also working. Headlights and side lights are in working order along with the left and right side indicators, however the indicators do not self cancel. The MK I also has a foot operated headlight beam dip switch that is located just to the left of the clutch, and it works! The windshield wipers work great with just the flip of a switch, and the push horn works too. The 1100 sits upon 4 solid tires donning MG crested hub caps. 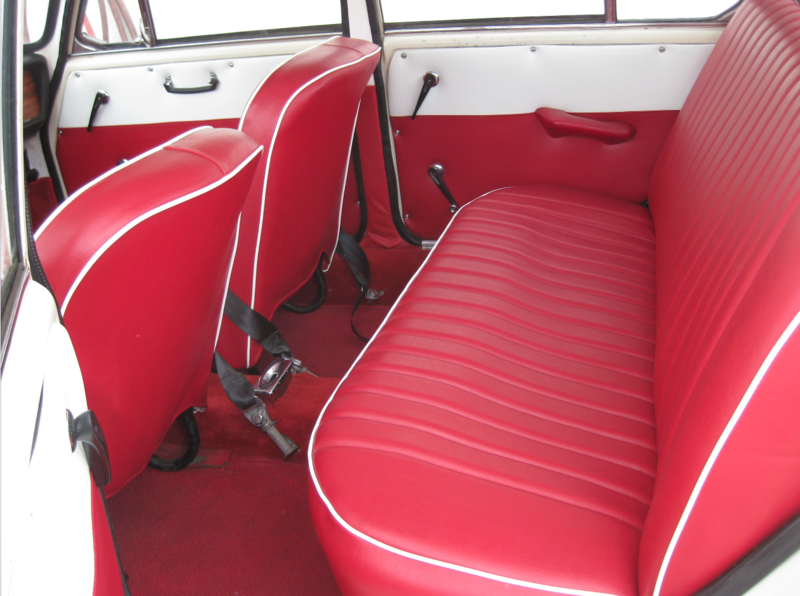 The exterior of the car is a charming off white color that has held up very nicely considering its age, and the red interior is in lovely condition and like new. It has had new floors put in. The chrome bumpers are nice and the front grille is in pretty good state, as it has been a bit squished on the right hand side (see picture). The windows are clear with some small scratches on the rear window as well as on the rear drivers side passenger door, however overall aesthetically this car is really pleasing. The trunk space is tidy and spacious, and includes a spare wheel should it ever be needed. The engine compartment is complete and mechanically sound. If you are an MG enthusiast looking for a car that isn’t your typical everyday run of the mill MG, than look no further because this is the MG you’ve never known you’ve always wanted! This car is truly a head turner simply because its eye catching and particularly uncommon, also not to mention very practical as well. A hard top 4 door MG 5 seater is just not something you often come by, and classic cars that can fit a whole family are even more unheard of, so don’t delay and bid to win this for not just yourself but for the entire family! As always I would advise inspecting the car in person if at all possible. It will not disappoint. Please call for an appointment or with any questions you may have, (310) 833-1525.